An F/A-18E Super Hornet assigned to the Stingers of Strike Fighter Attack Squadron (VFA) 113 prepares to land on the flight deck aboard the aircraft carrier USS Theodore Roosevelt (CVN 71). US Navy photo. The Boeing team preparing for the F/A-18E-F Super Hornet service life modification (SLM) program has begun tearing into one of the fleet’s most-used aircraft and found the plane does not have as much age-related damage as predicted, the company’s service life modification program director told USNI News. When Boeing and the Navy sought to extend the life of the legacy F/A-18A-D Hornets past the original 6,000 hours of flight time to 9,000 or 10,000 hours, major structural damage was found in many of the planes and the life-extension work took longer than anticipated, as the Boeing team had to wait on additional materials and figure out how to address unforeseen work. This time around, as the newer Super Hornets are brought in for a similar life extension, Boeing completed a Service Life Assessment Program to predict age-related damage to the planes, and the company is now validating those predictions against two learning airplanes – high-use jets, one of them being the fleet leader in catapult launches and arrested recoveries. “We have not found any significant indications beyond what we were expecting. In fact, in some areas we found significantly less than what we were expecting,” SLM program director Mark Sears told USNI News on Oct. 17. He cautioned that Northrop Grumman still has to complete its work on the aft end of that first aircraft, and then the companies will tear apart the second learning plane for additional information. Before Boeing cut into the first learning aircraft, the team conducted an age exploration piece, which looked at both the material condition of the planes and sought to understand how internal components could best be reached from the outside when the modifications begin. On the material condition piece, Sears said the two planes looked “actually very good” and “better than we would have expected,” given the condition of some of the other Super Hornets that have come through Boeing’s Cecil Field for depot maintenance work. On the accessibility piece, he said it was a mixed bag. “We thought we were going to have to remove wings to gain access to some locations to do the [service life extension program] mods. We proved that we were not going to have to do that, which is great – that’s both a lot of effort in terms of turnaround time and duration as well as the opportunity to introduce risk,” he said. Now that the first plane has been torn apart, the company is looking for signs of other damage not predicted in the assessment program, which would then be analyzed and potentially added into the work package if it is likely to be a prevalent problem. 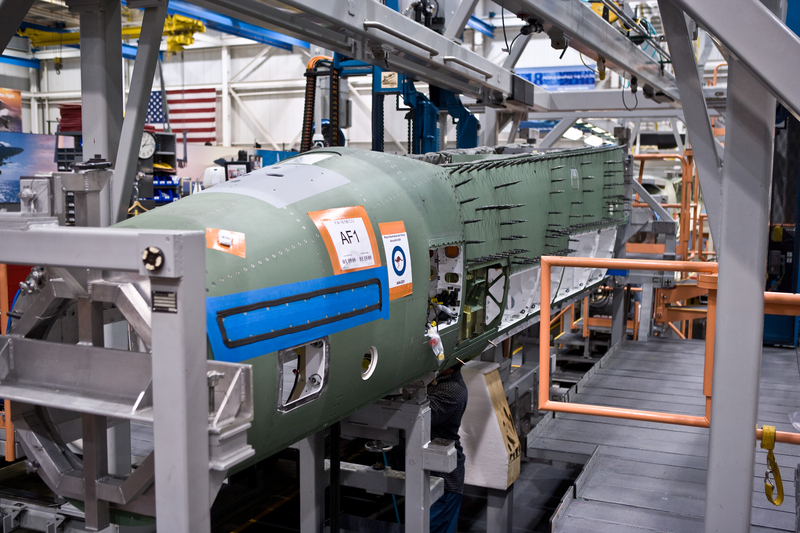 The outer skin of the first Boeing F/A-18F Super Hornet for the Royal Australian Air Force (RAAF) is fitted to its forward fuselage on a pulse assembly line in St. Louis. Boeing photo. Even as this learning process is still underway, the company is already ordering materials and getting the production facility set up for the first aircraft’s induction, which now appears to be set for April 2018. Four airplanes will come in for the SLM work in calendar year 2018, and those will be worked on in St. Louis, where the company also builds new Super Hornets. Having the life-extension work take place near the production engineering team leverages a lot of experience, and it also provides more options if material is delivered late, or the first couple planes require unplanned work. Ultimately, about 80 percent of the airplanes will be worked on in San Antonio, Texas, in a facility set to begin accepting aircraft in 2019. Prior to that facility opening, Sears said the idea was to “validate things here in St. Louis and then replicate them down in San Antonio.” Once the San Antonio facility is up and running, Sears said Boeing expects to be working on about 50 airplanes at any given time. While the first plane is expected to take about 18 months to complete – the company will have an idea of how to sequence the work but will learn a lot when they actually conduct that work package on a plane – Sears said later planes will hopefully take closer to 12 months. Material is already being purchased, he said, though as to specifically what each aircraft will require, “at this point, it’s a guess. It’s a guess based on data, but it’s still a guess. So we’re erring on the side of buying heavy early, trying to buy down risk on material lead time for those first jets. But our forecast – we’ve shown this on other programs – as we go through quantity, our forecast will get much much better in terms of being able to predict quantity of parts over time,” Sears said. Finally, the company is still in talks with the Navy about incorporating capability improvements into the life-extension program. “The Navy has said SLM is not your traditional SLEP program, it’s their comprehensive service life [modification] program. So to focus solely on getting the structure to survive but not focusing on capabilities is, I think, shortsighted, is what they’ve said,” Sears said. 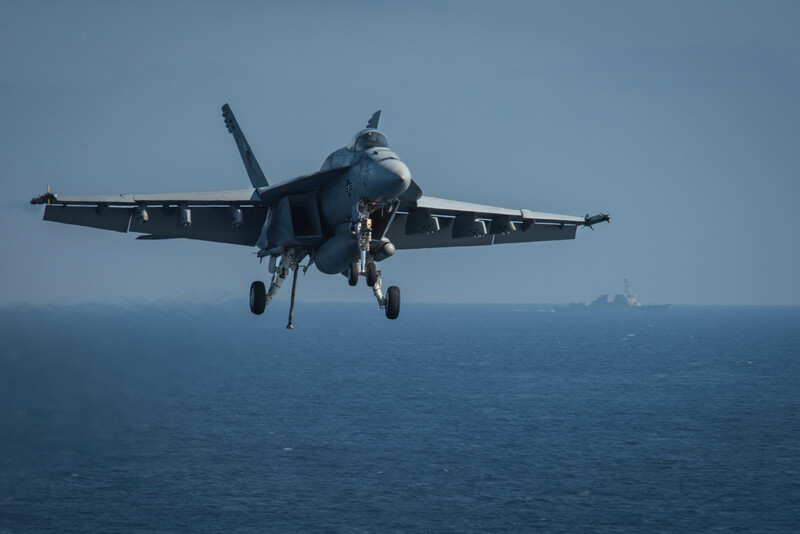 Boeing believes its Block 2 aircraft – the majority of Super Hornets flying today, and the configuration coming off the production line today – are the best candidates for the Block 3 capability upgrade. The Navy is in talks with the company about introducing a package of upgrades into the new production line in late 2020, Sears said, with planning and engineering taking place between now and then. Retrofitting the upgrades into the planes going through the SLM process could piggyback off that planning and start a few years after being inserted into the production line. “It’s a great opportunity to insert capability like the Block 3 in a method that is least impactful to the fleet, so that when an aircraft is returned with an extended life it’s also got the right capabilities for the next decade,” Sears said. Copyright © 2019 Association of Naval Aviation in Virginia Beach, Virginia - Hampton Roads Squadron. All rights reserved.